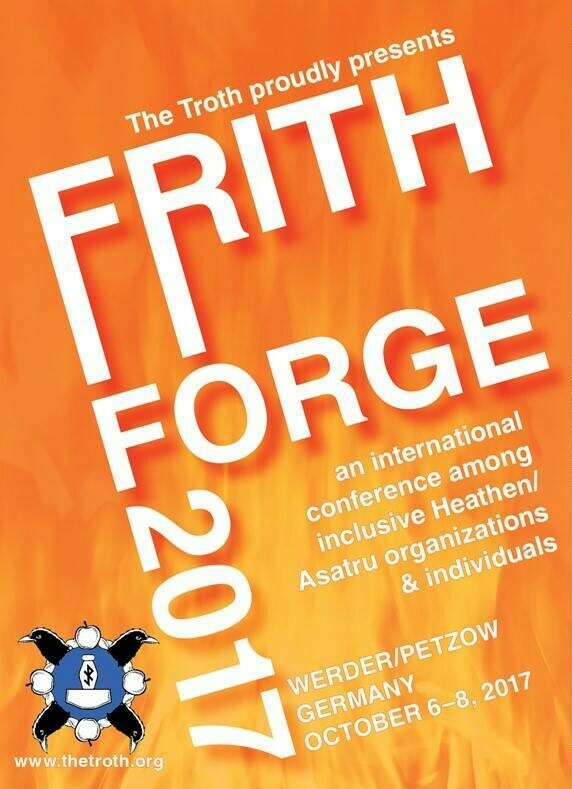 On Saturday, I presented the following paper at Frith Forge, the first international conference focused on inclusive Ásatrú and Heathenry. The event was held October 6-8, 2017, outside of Potsdam, Germany. There were thirty-one participants in attendance who represented fourteen organizations from twelve countries. I will be writing a full report on the conference for The Wild Hunt later this month. I attended as goði (priest) of Thor’s Oak Kindred in Chicago and as a member of the Troth Clergy Program. 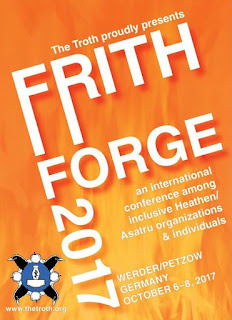 I am very grateful for the opportunity I was given to address the attendees by the event organizers from the Troth, the international Heathen organization dedicated to inclusivity, education, scholarship, and training. What follows is the full text of the paper that I read on October 7. Footnotes are included at the end of each section, and a bibliography appears at the end of the paper. Any Ásatrú or Heathen authors interested in contributing to the theological project proposed in the paper’s final section are welcome to get in touch with me via The Norse Mythology Blog’s contact page. This paper makes the case for a new direction in Ásatrú theology. After making a clear distinction between dogma and theology, a succinct review will be made of two common approaches to writing on theological issues within the cluster of modern Heathen religions. The paper will then address some pitfalls that have arisen in work that strongly focuses on either secular scholarship or personal religious experience. This paper forwards the notion that we embrace our identity as members of a new religious movement (NRM) that began in 1972 as we fully engage with contemporary issues. In Hávamál, Odin says, “A better burden may no man bear for wanderings wide than wisdom.”2 This paper suggests that we continue to carry the wisdom of the past, but that we resolutely turn our focus to embracing the world we live in today and to engaging the challenges of the present with the resources of wisdom that we carry. In conclusion, the paper calls for a collaborative international project to produce a collection of original public theology by authors from a wide variety of perspectives. In informal conversations with other Heathens, my suggestion that there is a need for new Ásatrú theology has sometimes been met with the somewhat hostile declaration that “we don’t want dogma in Heathenry.” The less polite response has been to assert that the very act of writing a theological work actively forces one’s personal dogma upon other practitioners. To clarify matters, and to clear the path for productive discussion, I offer basic working definitions of these two terms so that their quite different meanings can be set at the outset. Already in ancient Greek, the noun form of the ancestor of our modern English word meant “that which seems to someone, opinion, belief, doctrine, decree.” The sense had even then begun the move from that which seems good to a belief forged into a formal statement. In classical Latin, the term came to mean “doctrine, tenet, principle,” and then, in post-classical Latin, “decree, order, orthodox belief, religious doctrine.” It is this latest sense that we use it today, when we accuse other Heathens of attempting to claim authority and force their beliefs on others. For our purposes, we can combine elements of Van A. Harvey’s detailed definition5 and define doctrine as “those official beliefs explicitly formulated by the leaders of a religious group and thought to be so fundamental that to deny them is warrant for expulsion from that body.” It is aversion to doctrine in this sense that, I think, drives some Heathens to react so negatively to the idea of theology. There are actually many examples of doctrine enforced in various Heathen communities, but what matters for this paper is that doctrine is really distinct from theology. In modern times, there is a daunting diversity in an enormous field. Theology can be ecumenical, exegetical, fundamentalist, historical, homiletical, liberal, moral, philosophical, practical, spiritual, and so on. It can focus on liberating the oppressed or increasing the prosperity of the wealthy. Within any subset of each subdiscipline, there are disagreements as fierce as any we see within the various branches of Heathenry. All this is to emphasize that theology is not doctrine. Theology may discuss doctrine, but it plays a wholly different role in religious life. There are as many theologies as there are theologians. A work of theology may certainly attempt to convince, but the method is reasoned argument rather than dogmatic command. In order to move into the topic at hand, we can define theology as “discourse on the divine and its relationship with the world.” There are a many other possible definitions, but this one recommends itself with (1) emphasis on reflection, communication, and discussion and (2) recognition of Heathen ideas of world-affirmation and the interconnectedness of the material and the spiritual. 3 Oxford English Dictionary, s.v. “dogma,” http://www.oed.com.ezproxy.gl.iit.edu/view/Entry/56479. 6 Brown, 133 and Cancik, 43. There has been a great diversity of Heathen writing published over the last thirty years, and it has exhibited as much of a diversity of approach as can be found in the works other world religions. I would like to discuss two broad trends that can be found throughout the modern Heathen corpus. They are very often intertwined within a given individual work. First, there has long been a turn to secular academia for material and as authority. Second, there is a long tradition of turning to what Heathens call “unverified (or unverifiable or unsubstantiated) personal gnosis” (UPG), to what William James called “direct religious experience” and what believers in other traditions may call revelation or vision. The turn to secular academia takes several forms. In general, Heathens writers incorporate the work of non-Heathen academics by (1) summarizing pre-existing data, interpretations, and conclusions to provide a pre-1972 context for modern beliefs and practices and/or (2) citing the pre-existing data, interpretations, and conclusions to lend the heft of authority to their own beliefs. A few examples should make this process clear. In A Practical Heathen’s Guide to Asatru, Patricia M. Lafayllve provides a prime example of what are known among Heathens as “Ásatrú 101” books. When she turns to historical Germanic paganism, she uses information gathered from a group of secular scholars whom today’s Heathens repeatedly turn to as sources: Davidson, DuBois, Dumézil, Larrington, Lindow, and Page. These names and a handful of others turn up over and over again in Heathen footnotes and bibliographies. From an academic standpoint, it’s notable that the works cited are almost uniformly book-length retrospective presentations and almost never articles from academic journals. Although Dumézil is usually referenced with a standard caveat questioning the applicability of his tripartite theory to Old Norse materials, these select scholars are generally cited as unproblematically authoritative sources for information on historical religious beliefs and practices. The work of Robert L. Schreiwer and Ammerili Eckhart on the new religious movement known as Urglaawe (which they translate from the Pennsylvania German dialect as “primal faith”) exemplifies a second mode of turning to secular scholarship. In this case, the sources used are from the field of folklore studies in the twentieth and twenty-first centuries. The bibliography to A Dictionary of Urglaawe Terminology includes a number of folklore collections, academic studies, and articles side-by-side with Davidson and Larrington. Jacob Grimm’s monumental Teutonic Mythology also appears; the work has remained greatly popular as a source for modern Heathens long after academics dissected it and left it behind. Schreiwer and Eckhart integrate the academic folklore work new and old into their vision of a modern religion. As in other Heathen works, they tend to accept the scholarly sources as authoritative. A standard work in the modern Heathen library is Eric Wódening’s We Are Our Deeds: The Elder Heathenry, Its Ethic and Thew. In a method that would likely surprise theologians from other religious traditions, Wódening builds a Heathen ethical system almost entirely on dictionary definitions of words from Old English, Old Norse, and related Germanic vocabularies, as well as theoretically reconstructed Proto-Germanic and Proto-Indo-European words, root-forms, and their scholarly definitions. Although his bibliography includes standard academics regularly cited by Heathens (Bauschatz, Byock, and Turville-Petre), the preponderance of the text turns to ancient and theoretical words treated in isolation and examined through their definitions in a small selection of dictionaries. While Wódening has created a work of ethics that has been greatly valued and very influential in some sectors of modern Heathenry, the process of deriving an ethical system from modern academic etymological work raises many questions. The turn to personal religious experience also takes several forms. Heathen authors who go down this path tend to (1) incorporate results of ritualized magical workings, (2) report information gained from visionary states, and/or (3) make definitive statements based on idiosyncratic personal beliefs. Again, a few examples will clarify this approach. Stephen Flowers, writing under his pen name of Edred Thorsson, divides his 1987 Runelore: A Handbook of Esoteric Runology into two sections. The first, “Historical Lore,” uses a generally academic tone to review standard historical material from the academic discipline of runology. Flowers breaks with mainstream academia when he connects early Germanic and Viking Age rune usage to German racist nationalist Romantic mystics, Nazi occultists, and modern rune magicians as part of a unified grand narrative. The real break with academic tradition is in the book’s second half, “Hidden Lore,” in which Flowers declares that he and his colleagues in the Rune-Gild “go well beyond the limited academic/scientific aspect” and “quicken the wooden forms of academic findings with the inspiration of Ódhinn.”8 For the rest of the book, Flowers freely mixes references to historical, literary, and mythological material with ideas rooted in his own magical practice and occult work. When the book is taken as a whole, the first, historical part seems mere prelude to the UPG-based second half, which is presented as a guide for the would-be initiate. The move from individual vision to group reproduction of that vision to statement of the goddess’s own preferences is a clear example of how individual revelation can spread through a religious community and become accepted as a socially verified gnosis. This last example clearly shows some issues that can arise from a UPG-based approach, but I would like to more clearly examine some general problems with both the academic and experiential modes of writing. In a cluster of religions without central authority or dogma, there is a paradoxical and continual struggle within Heathenry to assert authority while positing one’s own perspective as the one that is right and proper. Such assertions often turn to academia for authentication and justification. Perhaps surprisingly to those unfamiliar with the Heathen subcultures, practitioners sometimes adjust their religious beliefs to accord with academic works written by secular scholars who are openly hostile to modern Heathenry. Whether seeking to justify their own beliefs or to critique the practices of others, Heathens often turn to academic writing on ancient Germanic paganism as the fundamental arbiter of modern religious authenticity. Secular scholarship on primeval paganism is widely seen as the fundamental ground of authority on what Heathen religions are in the twenty-first century. This belief in the primacy of non-Heathen scholarship as bedrock of belief, practice, and theology can be found in multiple iterations of Heathenry. The deference to academia cuts across divisions within the wider Heathen community. The scholars most often cited as sources for modern Heathenry do not focus on any of the Heathen religions that have been developed as living traditions since the founding of the Icelandic Ásatrúarfélagið (Ásatrú Fellowship) in 1972. Indeed, there has been some hostility within various Heathen communities to scholars who do study modern Heathenry, such as sociologist Jennifer Snook. Instead, the favorite scholars are mostly specialists in medieval Germanic (largely Old Norse) literature, medieval and pre-medieval Germanic religion, and archaeology of related areas and periods. The literature covered by the scholars is of the post-conversion period, given that the writing down of long texts (i.e., not short inscriptions on stone or wood) arrived in northern Europe with the coming of Christianity. Although poetry may have been composed by pagan poets and passed down via oral transmission, the major mythological poems were not codified in writing until over two hundred years after the conversion of Iceland. The Icelandic sagas, often mined by Heathens for descriptions of belief and practice, are works of historical fiction composed by Christians centuries after the events they purportedly record. “Belief in the æsir” is a translation of Ásatrú, the name of the Heathen religion founded in 1972 in Iceland. The establishment of the Ásatrúarfélagið in that year was the first major event in the worldwide revival, reconstruction, and reimagining of Germanic polytheism. Today, the organization continues to thrive, and Ásatrú is now the largest non-Christian religion in Iceland. Lindow’s work was published in 2001, nearly thirty years after the Icelandic government officially recognized the religion. There were decades of media coverage by this time. For example, in the year 2000, a major conflict occurred between the Ásatrú group and the National Church of Iceland over events surrounding the thousandth anniversary of the nation’s conversion; over one thousand people attended the Ásatrú event. Given the seriousness of Lindow’s scholarship, it is odd that he chose to minimize the history and practice of the Ásatrú religion by referring to it as some strange thing in the past and making dismissive comments about tax breaks, partying, and sausage. It is difficult to imagine a Berkeley professor writing a guide to historical Judaism or Islam turning aside from their ancient sources to make a derogatory remark about today’s Jews or Muslims in their published work. We all pick and choose what we want to use from problematic sources. As adults, we are capable of noting the bias of authors as we evaluate their work. The important question here is this: why would Heathens privilege the work of an outsider who openly slanders their religion over the writing of those within their tradition? What other world religion sets up such a self-abnegating hierarchy? Imagine practitioners of Judaism today basing their theology on works by non-Jewish archaeologists who include anti-Semitic statements in their texts. Imagine Muslims around the world privileging non-Muslim literature professors who take Islamophobic positions in their studies over books by their own writers. Imagine members of any minority faith fundamentally altering their spiritual beliefs to line up with theories of scholars who openly denigrate their religion. Some Heathens may read the passage quoted above and say, “He’s right! The Icelanders are doing it wrong. Only those of us who practice like the members of my Facebook group are true Heathens.” Such attitudes are similar to those of the Germanic or Celtic tribes who allied themselves with Rome in order to gain power over local rivals. Such willingness to celebrate public disparagement of Heathenry in order to move up in an in-group pecking order is closer to jockeying for position in subcultural online communities than to thoughtful theological discourse. Even worse, the desire to declare one’s own denomination superior to all others often feels like fundamentalism. None of this is to say that the study of scholarship is unimportant. In order to revive, reconstruct, and reimagine Germanic Paganism today, a deep engagement with the heritage of Heathen history is of great importance. The issue here is how practitioners of living religions engage with academic work on ancient sources as the primary authorities for today’s belief and practice. There is not an equal sign between modern Heathenry and pre-Christian Germanic polytheism of the Long-Ago Time. Academic work on one does not necessarily transfer onto the other. A medievalist’s theory regarding the portrayal of women in mythical poetry of medieval Iceland is interesting. It’s fascinating. It can provide us with insights into ways in which male poets of that particular time and place portrayed idealized or stereotyped images of women on the mythic level. It can enrich our understanding of the changing status of women on the island during the age of conversion. But to use this sort of literary study to determine the nature of one’s experience of deity in the wider twenty-first-century world is a very strange thing. There is a strong division drawn by many Heathens between secular scholarship on one hand and unverified personal gnosis on the other. Academic writing by non-practitioners is portrayed as definitive, despite the fact that there are arguments between scholars and changes in scholarly approaches over time. The ability to footnote one’s beliefs and practices by citing a passage from a publication of a university press is widely valorized in Heathen communities. Personal experience of the spiritual is often seen as (at best) something one should keep to oneself and close relations or (at worst) a bunch of nonsense that deserves the harshest public ridicule. This portrayal of religious experience as something to be hidden and mocked is deeply problematic. Yes, if someone insisted to me that the only true Heathen belief is of Loki’s son Narfi as the light of the world and savior of mankind, and that Narfi’s mother is really Mary Magdalene, and that the one proper ritual worship is to eat burnt cat hair, all based upon a dream he had after eating a large anchovy pizza before bed, I would smile politely and back away. However, I would have a similar reaction if someone told me that she could undo a lifetime lived in modern society and consciously alter her consciousness in order to erase all of her experiences and replace her worldview and causal belief system with that of a male warrior in a first-century Germanic tribe, based upon her reading of an academic journal article illegally downloaded from Scribd. The old mythological poems that survive are — if not written as antiquarian works — based on UPG. The old representations of mythical figures in art are — if not simply made to order — based on UPG. The religious objects found in religious settings are — if we accept the interpretations of past generations of archaeologists that they are indeed driven by religious belief — based on UPG. Religious experience cannot, by definition, be verified. Some may respond that past UPG became verified when it was accepted by the community and stood the test of time. However, our theoretical understanding of past Heathenry is mediated by centuries-later (sometimes hostile) Christian writers and millennia-later (sometimes hostile) secular scholars, which makes it quite difficult to definitely know exactly what specific UPG was accepted by what community. As for standing the test of time, we wouldn’t need to discuss any of this if ancient Heathenry had not disappeared as a set of public religions. In any case, to assert that the supposed beliefs of the past are somehow verified is to go against the very academic system that is cited for support. Interpretations and explanations of the textual and material sources change with the generations. Compare the old scholarly works insisting that every myth is really about the return of the sun to new scholarship insisting that the trolls of lore are really racist representations of the Sámi people. The idea of changing one’s religious belief and practice with every new theory published is simply bizarre and, in fact, not what is done; practitioners hold on to the scholarly works that they feel reflect something real and authentic, even if they have long been rejected as spurious by subsequent scholars. A case in point is Hilda Roderick Ellis Davidson, whose 1940 PhD thesis and 1964 non-academic introduction to Norse mythology continue to be regularly cited by Heathens long after being dropped from academic use. Valorizing past religious experiences as more valid than present ones fetishizes the past in a way that it is hard to imagine those living then would have themselves done. Literary and material evidence suggests that beliefs and practices changed greatly over time, even in a specific location. New ways arose, whether from outside pressure, internal dissent, spiritual experience, or any of a host of unknowable causes. An argument can be made that we must have a different relationship to past Heathenry, given the long centuries without public practice of Germanic paganism. I am not challenging this idea but rather the privileging of theoretical reconstruction of past religious experiences over those of today’s living religions. The very distinction that is made between academic sources and modern UPG sets up a dichotomy that unfairly favors secular academia as authoritative in a way that denigrates actual religious experience. Those who champion scholarly authority parody anyone who disagrees with their own positions as hopelessly unintellectual and goofily mystical. Those who question the hegemony of outside scholarship and insist on their own personal experience fight a losing battle that is not helped by the prevalence of the most extreme visionary claims in the online world. Posting on social media that “Loki loves me! This is know, for he manifested as Tom Hiddleston in my shower, held me close, sang me a Nickelback song, and told me so,” then calling anyone who questions your reliability a Nazi is not forwarding the cause of serious engagement with the numinous. There is another way. We can respect academics for their diligent scholarship and learn from what they write without treating their work as cudgels with which to beat down those whose views don’t line up with our own individual and idiosyncratic positions within Heathenry. We can accept that religious experiences today are not different in kind from those of the past and resist lumping in anyone who speaks from the heart with the most outrageous elements of online testimonials. To find a new path, we can choose to avoid the false opposition of academia-as-authority and experience-as-nonsense and instead turn to public theology of Heathenry. We can create deep, thorough, passionate, quality work that combines the best of what we have learned from the secular academics with the most powerful of personal experiences as we address the important issues of contemporary life. Rigor of study and depth of experience are not mutually exclusive. We must incorporate both as we create modern theology. What I am suggesting is a deep engagement by Heathens with both scholarship and experience that leads to a rich body of works that exist in fruitful dialogue with each other and with the world in which we live. If we truly are a world-affirming and not a world-denying religion, we must affirm the world. We must engage with events and discourse in and across the societies we inhabit. Feminists long ago taught us that the personal is political. I would turn this dyad into a triad and assert that the personal, political, and religious are inextricably linked, whether we wish them to be or not. Heathens on the extreme-right fringe are already engaging in the conflicts of our times and have been doing so for quite a while. As Heathens of positive intent, we are disgusted by the mutual embrace between white nationalist Heathens and the latest version of neo-Nazis. However, these are the people determining the interface between Heathenry and the larger society. These are the people interviewed by journalists, featured in media reports, and covered by academics. These are the people who our non-Heathen friends and colleagues see and read about. These are the people who are the public face of Heathenry. By repeatedly reacting to them, we allow them to set the parameters of public discussion. Yes, we must denounce their hateful statements and actions and insist that they do not represent the mainstream majority of worldwide Heathens, but we are in danger of becoming mere footnotes and allowing the extremists to become the main story of modern Heathenry. As I alluded to earlier, the distinction I have been making between scholarly and experiential writing in Heathenry is not really so distinct. Much excellent work has been done that bridges these approaches. The massive two-volume edition of Our Troth – composed collaboratively by members of the Troth – brings together a wide variety of Heathen authors from a multiplicity of perspectives as it bridges the scholarly and the spiritual. Sacred Gifts by Kirk S. Thomas may be written by a Druid, but it is greatly valued by many Heathens and is a model of combining dedicated research of primary and secondary sources with an open discussion of personal religious experience and spiritual insight. However, what these and other excellent texts have in common is that both the academic and experiential streams are funneled into the cauldron of religious belief and religious ritual. We study ancient texts to understand concepts of deity, we meditate in order to learn how to address the gods, and so on. A living religion needs these things. It needs a connection to tradition and community. It needs an understanding that is both intellectual and spiritual. What I am suggesting is that it also needs something more. Jörmundur Ingi Hansen once said of Icelandic Ásatrú, “The behavior of people within society is absolutely the same as within the religion. You have to be consistent in your beliefs, so you don’t believe one thing during the week and then switch over and believe something entirely different on Sunday.”17 If you agree with this – and I do – the question arises of how our beliefs affect our behavior in society. If we are not to imitate Sunday-only Christians and be blót-only Heathens, we must ask how the beliefs we hold and the rituals we practice affect the other elements of our lives. Catholic religion journalist Kenneth L. Woodward writes that what drew him to Rabbi Abraham Joshua Heschel “was the understanding we shared of religion as hallowing the everyday,” the idea that Jews “are called to ‘sanctify time’ through daily prayer, observance of the Sabbath, and prophetic witness.”18 As Heathens, we have our own forms of prayer and holy days, but we are missing the element of prophetic witness in the sense of speaking truth to power. For me, this is something that fits with the theology of Thor, the god who stands against the serpent who threatens the world, even though it means his own destruction. It fits with the theology of the Seeress, the wise woman who addresses the revelation of her grand vision of past, present, and future to all the children of Heimdall, to all humanity. It is time for us to stand up and for us to address the world. Decades ago, the progressive Catholic theologians of Latin America created Liberation Theology “in response to Vatican Council II’s declaration that the church should immerse itself in the problems of the world.”19 With their incredible dedication to fighting for the common folk against their oppressors, the Liberation Theologians went too far for the pope and were publicly censured by him. Heathens are already immersed in the problems of this world. The very existence of this conference shows that we are. Let us learn from the brave Liberation Theologians, many of them martyrs for liberty, and let our knowledge of lore, our study of scholarship, our living of ritual, our experience of the divine, and our love of this world guide us to create a new theology that engages with the important issues of our time. The basic form of this theology can be simple: identify an issue, discuss it in the context of a Heathen worldview, and offer a path forward based on Heathen ideals. If Heathenry in all its forms is truly unique and fundamentally different from the dominant world religions that have for so long determined the course of world events, we should be able to offer new perspectives and solutions. We have all been transformed by our practice. I believe this transformation gives us insights into today’s events that are valuable and deserve to be heard – not just by other Heathens, but by all the children of Heimdall. A small group can make a large impact. The twelve men and women who met at Reykjavík’s Hotel Borg in 1972 began a modern religious movement that now has followers of its various forms in ninety-eight countries. If only a few of us agree to write in this new mode of Heathen theology, we can make positive changes in the wider world. I hereby offer to serve as editor for the first international anthology of the public theology of Heathenry. I welcome all who practice an inclusive form of Heathenry to contribute to this project. I invite those who want to write an essay or already have written one that fits this model to contact me. I will work to gather a collection of writings on a variety of issues from a multiplicity of perspectives from a range of locations. I am willing to work with writers to get their essays into a proper format, and I am willing to find a publisher who can really get this work to the wider public. We came here to Germany to build frith and to build bridges. Let us now work together to make a positive impact on this world that we affirm in our hearts and with our deeds. Hail to the frith-weavers and hail to those who stand against the serpent, for we deeply need those who work for peace and those who resist the forces of darkness. 17 NextTV, “Asatru in Iceland,” https://www.youtube.com/watch?v=u1nI1qA9zJQ. Bellows, Henry Adams, trans. The Poetic Edda. New York: American-Scandinavian Foundation, 1923. Brown, Stephen F. “Medieval Theology.” In The Blackwell Companion to Modern Theology, 133-146. Edited by Gareth Jones. Oxford: Blackwell Publishing, 2004. Cancik, Hubert and Hildegard Cancik-Lindemaier. “The Truth of Images: Cicero and Varro on Image Worship.” In Representation in Religion: Studies in Honor of Moshe Barasch, 43-62. Edited by Jan Assmann and Albert I. Baumgarten. Leiden: Brill, 2000. Durkin, Philip. The Oxford Guide to Etymology. Oxford: Oxford University Press, 2009. Flowers, Stephen (as Edred Thorsson). Runelore: A Handbook of Esoteric Runology. San Francisco: Weiser Books, 1987. Harvey, Van A. A Handbook of Theological Terms. New York: Touchstone, 1992. Kim, Sebastian. “Editorial.” International Journal of Public Theology 1 (2007), 1-4. Lafayllve, Patricia M. A Practical Heathen’s Guide to Asatru. Woodbury, Minnesota: Llewellyn Publications, 2013. McNallen, Stephen A. Asatru: A Native European Spirituality. USA: Runestone Press, 2015. Paxson, Diana. Essential Ásatrú: Walking the Path of Norse Paganism. New York: Citadel Press, 2006. Schreiwer, Robert and Ammerili Eckhart. A Dictionary of Urglaawe Terminology. Published by the authors, 2012. Woodward, Kenneth L. Getting Religion: Faith, Culture, and Politics from the Age of Eisenhower to the Era of Obama. New York: Convergent Books, 2016. Some parts of this paper appeared in an earlier version at The Wild Hunt.